Other Notes: Malt – Golden Promise. Hops – Hercules, Citra and Mosaic. 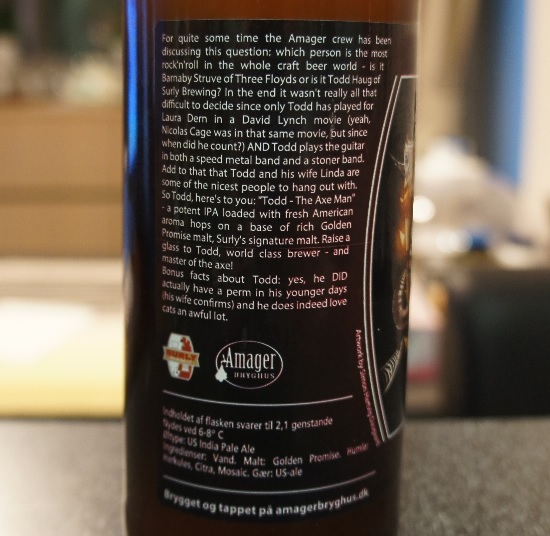 Brewer Description: (from bottle) For quite some time the Amager crew has been discussing the question: which person is the most rock’n’roll in the whole craft beer world – is it Barnaby Struve of Three Floyds or is it Todd Haug of Surly Brewing? In the end it wasn’t really all that difficult to decide since only Todd has played for Laura Dern in a David Lynch movie (yeah, Nicolas Cage was in that same movie, but since when did he count?) AND Todd plays the guitar in both a speed metal band and a stoner band. Add to that that Todd and his wife Linda are some of the nicest people to hang out with. 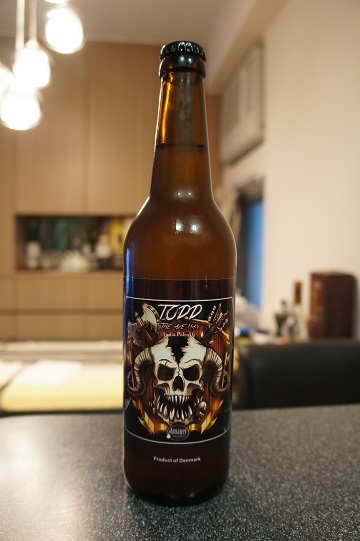 So Todd, here’s to you: “Todd – The Axe Man” – a potent IPA loaded with fresh American aroma hops on a base of rich Golden Promise malt, Surly’s signature malt. Raise a glass to Todd, world class brewer – and master of the axe! Bonus facts about Todd: yes, he DID actually have a perm in his younger days (his wife confirms) and he does indeed love cats an awful lot. 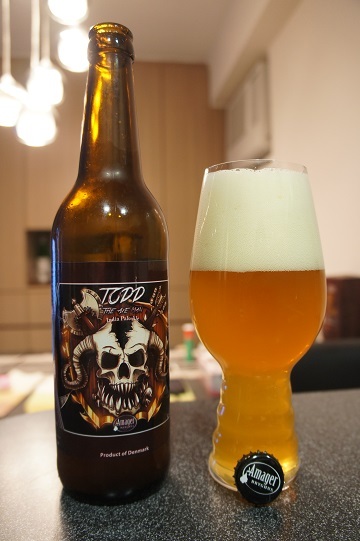 Intro: A 500ml bottle from batch #911 with a best before date of November 2015 and poured into a Spiegelau IPA glass. Appearance: A slightly hazy golden orange colour with a three finger fluffy white head that has pretty good retention and leaves thick sticky lacing. Aroma: Tropical apricot and peach aromas, with some pineapple, orange and hints of lemon. Taste: Light caramel malt sweetness gives way to citrus bitter grapefruit and orange peel. There’s even a hint of tropical mango. Mouthfeel: Dry, medium bodied with medium carbonation. 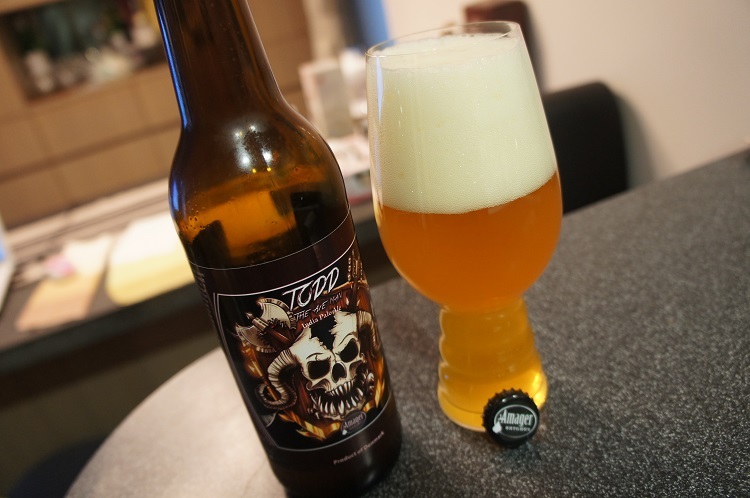 Overall: I have not tried the Surly version yet, so I can’t say which I think is better, but apparently the difference is that Surly chose to use Warrior as the bittering hop whereas this Amager x Surly collaboration version uses Hercules. In any case, this collaboration version was a great IPA and very drinkable.